Engaging, moving and occasionally disturbing documentary that presents Afghan Star as a powerful force for change, but contrasts that with the fact that the contestants risk their lives by performing. 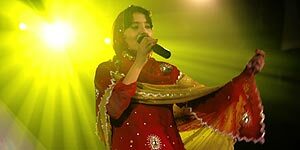 Afghan Star is Afghanistan's wildly popular version of Pop Idol, in which contestants compete for a cash prize of $5,000 (several times the national average salary) and the viewing public get to vote (by text) for the winner, which, for some, constitutes their first ever taste of democracy in action. Directed by Havana Marking (a filmmaker and journalist), the film follows four contestants as the competition reaches its final stages: male singers Rafi Naabzada Mazar-e-Sharif and Hameed Sakhizada and female singers Lema Sahar and Setara Hussainzada. The film does an excellent job of conveying the powerfully symbolic value of Afghan Star to its audience, not least because the four finalists each represent different tribal regions of Afghanistan and, instead of exacerbating the pre-existing rivalries, the contestants are shown supporting each other and constantly stressing that they are all Afghans. It's also implied that the support for each singer crosses tribal lines. In addition, it's important to realise that until relatively recently, television and music were outlawed in Afghanistan by the Taliban regime, so the show represents a genuine force for change. That said, this isn't quite the heartwarming competition-based documentary that the Spellbound-like set-up might lead you to expect; for one thing, the quality of the music and the singing is almost beside the point and we never really get to know the majority of the participants. Instead, the film brings home the shocking reality that the contestants actually risk their lives by performing; Rafi displays moments of paranoia about the fierce competition, while Setara provokes widespread outrage (even amongst her fellow contestants) and death threats by daring to loosen her hair and dance during her final performance. Afghan Star is an engaging and important film and what it lacks in depth, it makes up for in cultural impact. Worth seeing.